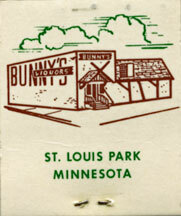 BUNNY’S – 4730 Excelsior Blvd. 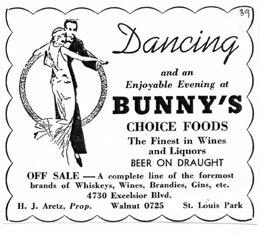 Henry Aretz (pronounced “Arts”) established one of the legendary bars in the Park in 1933, just as Prohibition came to and end. Henry was a builder, and had constructed the building on spec, hoping to sell it. Income from renters didn’t materialize due to the Depression, and they decided to open the restaurant themselves, despite having no experience in the field. The story goes that the place was intended to be named Aretz’s Place and went to a signmaker to get a sign. The signmaker had a sign he had made, possibly for a diaper service, with “Bunny’s” on it, and since he could get it cheap, Henry bought it. After opening the restaurant Henry continued to build. The family moved into a house behind Al’s bar that Henry had built while Henry built an apartment with a second floor onto Bunny’s. 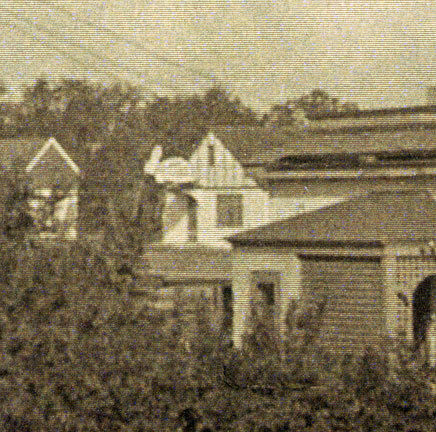 The family lived in the apartment at Bunny’s from at least 1935 to 1940. 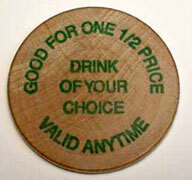 The Tavern had one of the first liquor licenses awarded after the end of Prohibition. There was a small bandstand and a piano where the kids could take lessons. In the basement was a sort of club room with a juke box where they could jitterbug to big band music. There was also a slot machine, which was legal in Minnesota until Luther Youngdahl became Governor in 1947 and spearheaded a successful effort to shut them down. After the war there were lines down the street to get into Bunny’s, it was so popular. Daughter Lorraine says that she’s met people all over he country who remember Bunny’s. 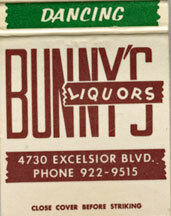 In November 1957 they added a liquor store, which was later moved to Miracle Mile and run by Henry’s son Harold. 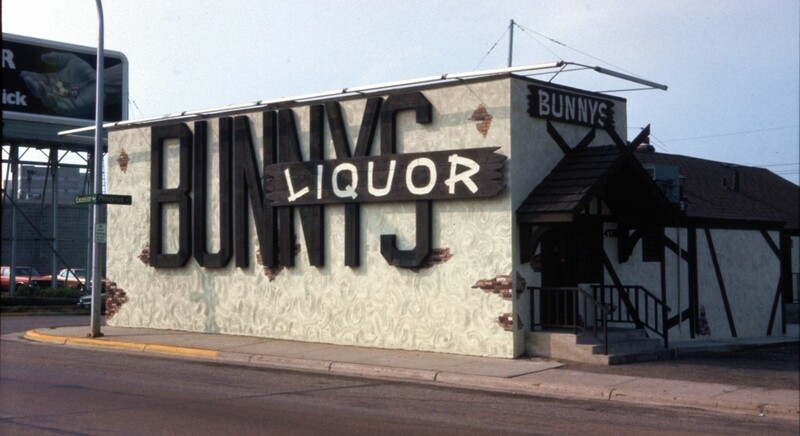 Given the position of this building in a 1966 photo, this must be Bunny’s. It must have had a facade put on the front. This wonderful bottle opener/phone dialer was donated by Mark Lapakko! On January 1, 1988, father and son Sherman and Gary Rackner bought the bar from the Aretz family and added a kitchen that fall. Bunny’s became a sports bar, with the bunny wearing a referee uniform. Sherman Rackner passed away in 1997. 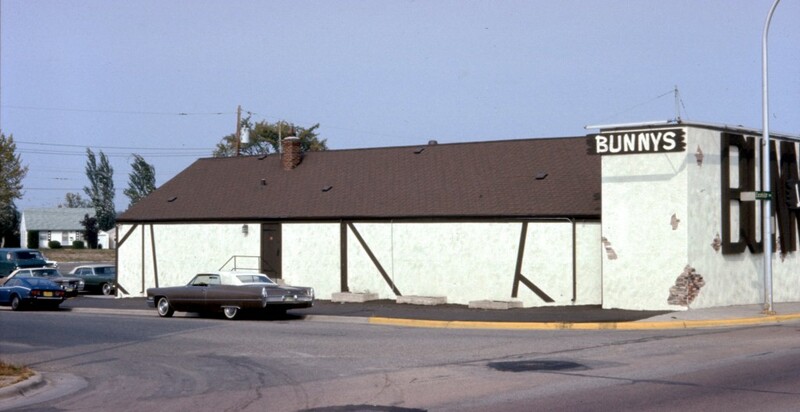 In January 1999 Gary brought in a new business partner, Steve Koch, and they moved the bar down the street to 5916 Excelsior to make way for Excelsior and Grand. 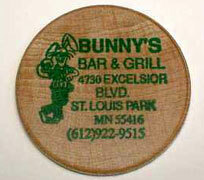 The name is now Bunny’s Bar and Grill, and it is probably the oldest and most popular business in St. Louis Park history.